If you're not a UFC fan or a gamer, you may not know about the sponsorship features in UFC's official licensed game, UFC 2009: Undisputed. The game, developed in a licensing deal with THQ, was released last May. To our knowledge there are three main levels of sponsor involvement in the title. Let's break them down. UFC fighters included in the game, and their agents, were given the opportunity to negotiate sponsorships for their own fight gear, which MMAPayout.com estimated to be worth $20,000-$75,000 depending on fighter. 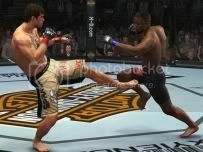 "Certainly the level of exposure through the video game is equal to that, or possibly even superior to, the level of exposure companies receive from fighters at live UFC events; and in this case, fighters on the main card (again depending on their popularity) are receiving at least $20k per placement," MMAPayout said when the game debuted. The article also notes the very real possibility of exclusivity conflicts for fighters. Fighters can unlock 33 sponsors by winning bouts and accruing skill level points. The final level (5) consists of the following sponsors: Conquest, MMA Warehouse, Warrior International, Sprawl and Tapout. Among the other sponsors are brands like Xyience, THQ, Harley Davidson and American Fighter. Setting the politics of which sponsors go where aside, tying sponsors to specific achievements within the game is a pretty novel idea. Check out the UFC Undisputed 2009 list of partners for more info. Every property is challenged with the task of efficiently enhancing sponsor value proposition while creating new streams of revenue growth. With the rise in virtual, console, online and mobile gaming; are properties packaging sponsor assets in these environments to the best of their abilities? Time was that in-game billboards and static sponsor signage was considered revolutionary. Of course, that time was when I was growing up with titles like Excitebike and Duck Hunt. THQ and UFC have taken sponsor involvement to a whole new level with this title. Online gaming's relatively new ability to offer, track, adjust tailored sponsor offers could present a gold mine of possibilities to properties and their sponsors. Or perhaps, such as in this case, use the title as a way to pad compensation. Can other properties step up their game... using games? ?